Thirteen star flags, representing our original thirteen colonies, have been produced throughout our nation's history, and are one of the most common star counts one can encounter. Some are small and printed for hand waving, while others are large and made to fly on navy and maritime vessels or simply to commemorate our 13 colonies. Their patterns are varied, though one of the most common is the 3-2-3-2-3, also known as the Hopkinson pattern after Francis Hopkinson of New Jersey, a signer of the Declaration of Independence and designer of this American flag pattern. Although the pattern is somewhat ordinary among thirteen star flags, occasionally one encounters a more common design on a flag of uncommon beauty, as is the case with this flag. 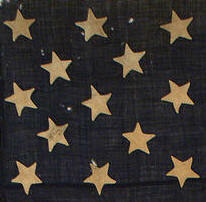 Dating to the period of the Civil War, or perhaps earlier, the flag is entirely hand sewn. Its beautiful stars are canted in various directions and, as a group, are somewhat off-center on the canton. The fly edge of the flag has been roughly trimmed, presumably to remove damage, though not folded back and re-stitched. Regardless of the losses to the fly end, the resulting proportions of the flag are pleasing, and seem to be "just right". The hoist of the flag is missing. Yet overall, the flag itself strikes me as a beautiful model example of an antique American flag, and is one of my favorites. 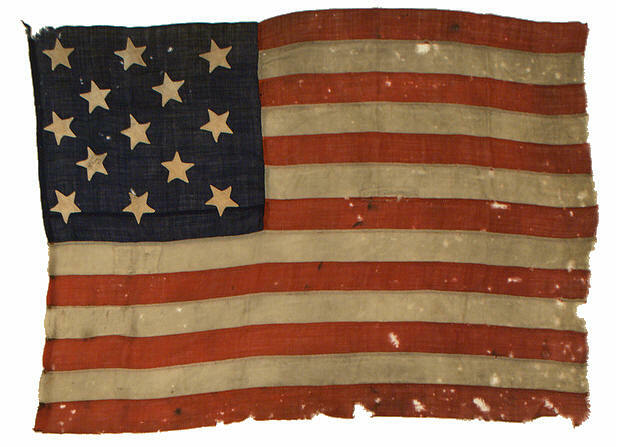 Its "look and feel", with its occasional patches and repairs, looks and feels like an antique American flag should. Its obvious wear, unpretentious utilitarian style and rich coloration elevates the flag to a picture perfect rendition of what one would imagine when they imagine Old Glory.